Congratulations to Matt Hutchinson for competing his PADI Divemaster course! The final test, the snorkel test was passed with flying colours so now he becomes part of our hall of fame. We’ve really enjoyed having Matt here and we’re sorry to see him leave. 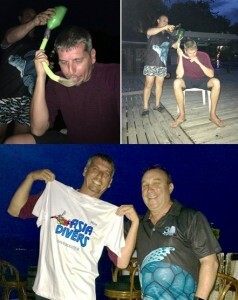 Matt got lots of real life experience during his Divemaster training at Asia Divers with students and divers and the being part of the team in the evenings at the Barrel Bar. Looking forward to seeing you back in September! Congrats to Toby Morton who became the 3rd generation of Morton’s to not only become divers, but also to be diving at Asia Divers. It was a very special time for Jamie to have Toby here from New Zealand and to be able to be his instructor. This was Jamie’s first certification as an instructor. This entry was posted in News and Events by Asia Divers. Bookmark the permalink.